Capt. 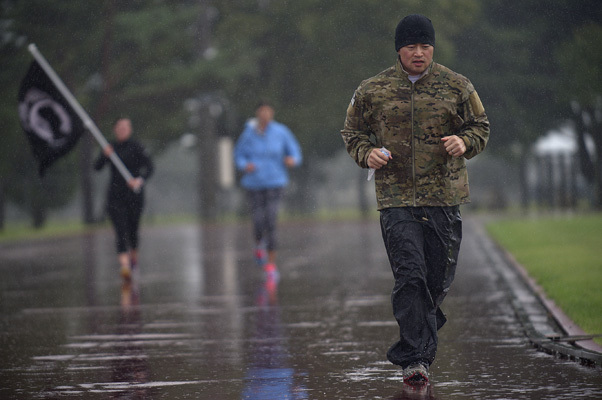 Michael Gruber, the 35th Communications Squadron director of operations, reaches his 65th mile while running in a downpour of rain Sept. 18, 2015, at Misawa Air Base, Japan. Beginning his ultramarathon at 5 p.m. on Sept. 17, 2015, Gruber’s goal was to run 100 miles in a span of 24 hours at the local high school track. MISAWA AIR BASE, Japan (AFNS) — He reached his 5th hour of running alone in the still of a dark, cold night lit only by streetlights surrounding the track — 25 miles down, 75 more to go. Nauseous, tired and consumed by a stomachache, Capt. 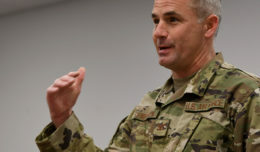 Michael Gruber, the 35th Communications Squadron director of operations, felt his head spinning into chaos but he knew he couldn’t let down those he came to honor. With a goal of running 100 miles in a span of 24 hours at the local high school track, Gruber set out to pay respect to America’s prisoners of war and missing in action, as well as stand in solidarity with his father who was recently diagnosed with lung cancer. Gruber decided to accomplish this feat only two weeks before the base’s POW/MIA 24-hour flag run as a way to pay tribute twofold. Beginning his ultramarathon at 5 p.m. on Sept. 17, Gruber set up a tent next to the high school track with supplies to support him through the next 24 hours of strenuous physical and mental demand. He also prepared for the onslaught of rain that lasted for half a day. Nevertheless, Gruber brought eight pairs of running shoes, socks and weatherproof clothing to help mitigate the impact of weather on his run. Despite being an avid runner who goes out and about Misawa’s running trails four to five times per week, the ultramarathon proved difficult. It was a combination of the evening start, monotony of running in circles, keeping track of laps, and not feeling entirely prepared that led to early fatigue. Luckily for him, he had his wife and father to keep him company via text messages. “I texted my dad, who told me at the start of the run he was with me for the entirety,” he said. He found relief when a fellow squadron coworker, Master Sgt. Seth Hogan, visited him at 2:30 a.m. 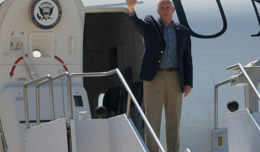 The combination of Hogan’s visit and texting his father, who was preparing for another radiation treatment in the U.S., pulled him through the night. As he continued his run through the downpour of rain and wind gusts, he closed in on the final moments of his run when a group of members from his squadron showed up in uniform to run the last moments with him. 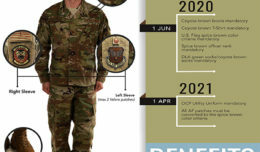 One of those members was 2nd Lt. Ismael Barragan, the 35th CS flight commander, who said he was blown away when he heard about Gruber’s 24-hour running endeavor. Barragan decided to run the last five miles with Gruber because of the sheer dedication he demonstrated in undertaking the challenge and knew Gruber had been alone most of the run. At the conclusion of the run, Gruber ran a total of 85 miles in 24 hours — 360 laps on the track. In the grand scheme of things, Gruber rated it as difficult but not the hardest run he has endured. “I’ve (also done) shorter races, from 65- to 75-mile runs to a handful of 50 kilometer and others,” he said. If he completed the 100 miles, it would have been his 5th time completing a 100-mile run. In the past he has also taken part in and organized runs as a way to honor fallen service members. “To me, the idea of shared strength is when you’re going through a tough place, it is always encouraging to have someone with you and (to know) someone is going through the same ordeal as you,” he said. Thoughts of his father going through another radiation treatment at the hospital while he was on the track running made Gruber feel he’d joined his dad in shared suffering. “It was me keeping in mind the pain and suffering of the POW/MIA and their families as well,” Gruber said. Though he did not quite meet his goal of 100 miles on this run, he does not like the idea of unfinished business.